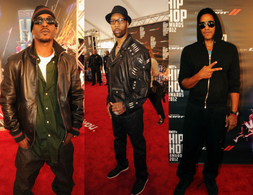 The threat of thunderstorms didn't stop hip-hop's finest from turning out for the taping of the 2012 BET Hip Hop Awards Saturday at the Atlanta Civic Center. (The show is scheduled for broadcast Oct. 9.) While some folks in attendance were checking for performances from Wiz Khalifa, 2 Chainz and Rick Ross, many other celebs were looking forward to the tribute to late music-industry exec Chris Lighty. The Root caught up with a few rising and veteran stars who shared their thoughts on Lighty, who died of an apparent suicide in August, and on the musical contributions of BET's "I Am Hip-Hop Icon" awardee Rakim. The Root: Why is Paid in Full considered arguably the best hip-hop album of all time? RZA: Well, not only Paid in Full but Follow the Leader, too. Rakim has laid down the footprint for a lot of rappers and MCs to learn how to follow the flow, the wordplay, the consciousness. He's one of the first brothers to have a true knowledge of self on the microphone and also the slang. Rakim is one of the greatest, and I'm really proud to see BET recognize that and give him his lifetime achievement award. He deserves it. Rakim is one of the few MCs that ever influenced me in my whole life. The Root: What's your favorite Eric B. & Rakim song? Damien Dante Wayans: Oh, my God, "What's On Your Mind?" I used to think I was Rakim! Craig Wayans: I love his stories. I love "Mahogany." The Root: Chris Lighty was your manager. How are you doing following his death? Diggy Simmons: You just got to move forward and celebrate the life more than mourn on it. Because he was an incredible person, and he did so much for hip-hop. The Root: What's your favorite Rakim album? Kosha Dillz: Paid in Full is obviously like the epic album. I used to rap over Rakim beats on a tape. It's pretty amazing that he's here. The Root: Please share your thoughts on Chris Lighty's contribution to hip-hop. Uncle Luke: I'm really excited to see Chris' tribute. You know, and I think that's really important for hip-hop because you never really see the people behind the scenes. And these are the guys that really make things happen. The Root: What influence has Rakim had on you? DJ Drama: Everything. I wouldn't be here if it wasn't for the R. Lyricism wouldn't be what it is if it wasn't for the homey. It's great to have him out here. I'm just excited to see [the tribute], man. The Root: What influence has Rakim had on hip-hop? Miguel: Are you crazy? Rakim — that's hip-hop. [He's one of its] like founding fathers. I've never had the pleasure of meeting Rakim actually, but I look forward to it. What he's meant for hip-hop period … He's just too stylish for everyone. The Root: Could you speak on Rakim's influence on hip-hop? Mystikal: Rakim, he's like the Wizard of Oz of this game. Real talk. The Root: What made Chris Lighty so important to hip-hop? Q-Tip: His business acumen. He rode out for all of his artists: 50, Busta, Missy, his employees. Like, he was unrelenting. I've known him since I was 17. So it's a great loss. TR: What made him so important to hip-hop? Ali Shaheed Muhammad (not pictured): We were his first artists. We're here to perform to honor his memory. So we're happy to be a part of that and to celebrate his legacy and what he's done for us and what he's done for hip-hop in general — as a father, a brother, a son. He's an awesome and incredible spirit. And he will be missed. TR: What makes Rakim one of the best lyricists of all time? Phife (not pictured): Huge. New York hip-hop. He's one of the best to have ever had done it. Potent lyrics, then until now. I'm real happy for him, and I hope he comes out with a new record soon. The Root: A lot of artists have their favorite Eric B. & Rakim song. What’s your most memorable song or album from your career, and what else can we expect from you? Rakim: The whole Paid in Full album. That was my introduction to the world, and that's what got me to this point here. So I praise that. Right now, we've got the Paid In Full anniversary album coming out. And after that, I'm going to get back into the lab and do another album. Hopefully, [there will be] a lot more from Rakim.